If you have printed the E-ticket please go directly to the skate change area. You are required to queue here. Please arrive at least 15 minutes prior to your skate session to allow time for skate fitting etc. I HAVE PURCHASED MY TICKET ONLINE BUT HAVE NOT RECEIVED MY EMAIL CONFIRMATION WHAT SHALL I DO? Firstly check your spam folder your E-ticket may have fallen into it also check all your email address including work and home If you still can’t find it bring your booking ref and we will look it up on the booking system at the rink If you don’t have your booking ref we can still look your booking up on the system please bring your card that you used for the booking. Please note if for any unforeseen reason the e-ticket is not delivered to your email, please print the PayPal confirmation email which will also have the details of time and date booked. I DON'T HAVE A PRINTER - WHAT SHALL I DO? Please bring you booking ref to the rink booking office and we will give you your tickets. Although we do advise booking in advance, tickets can be purchase at the rink. (Subject to availability). WHAT IS YOUR LARGEST SKATE SIZE? The maximum skate size is an adult’s size 16. Yes you can, although we reserve the right not to allow a person to use their own skates if we decide that they are not suitable.Speeds skates are not allowed. AT WHAT AGE CAN I BRING MY CHILDREN? The minimum age is 3 years old and are smallest skate size is a children’s size 8. All children 12 and under must be accompanied by an adult on the ice rink. Penguin skate aids are available to hire for a charge of £3 per session on a first come first serve basis at the rink and are not pre bookable, Penguins are hired out at the management’s discretion and are for children only under the height 1.2 meters. Wheelchairs are welcome on the ice, but at busy times due to safety reasons it will be at the management’s discretion. IS THERE A PHONE NUMBER I CAN CALL IF I HAVE A PROBLEM? 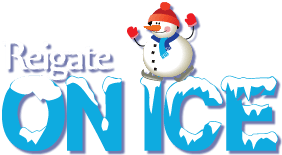 Sorry there’s no phone number to call please email us at bookings@reigateonice.co.uk we will do our best to respond within 24 hours. Please note, a child is defined by age and must be under the age of 16. If a child does not have any proof of age, it is at the discretion of the Ice Rink Management as to whether a child or adult ticket is required. Management holds the right to refuse entry and Ice Rink Management decision is final. No-one under the age of 3 years old will be allowed on the rink. 3-12 year olds must be accompanied by an adult on the rink. Management reserves the right to refuse entry/eject patrons from the rink without refund. Refunds are only given at management discretion. Personal belongings are left at the owner’s risk. Injuries resulting from collision or contact with other skaters. Injuries resulting from wet flooring. Do not smoke on entry to skate hire. If you are unsure about going on the rink, please check with a member of staff.